Hemsley, B., Georgiou, A., Balandin, S., Hill, S., Rollo, M., & Steel, J. (2015). 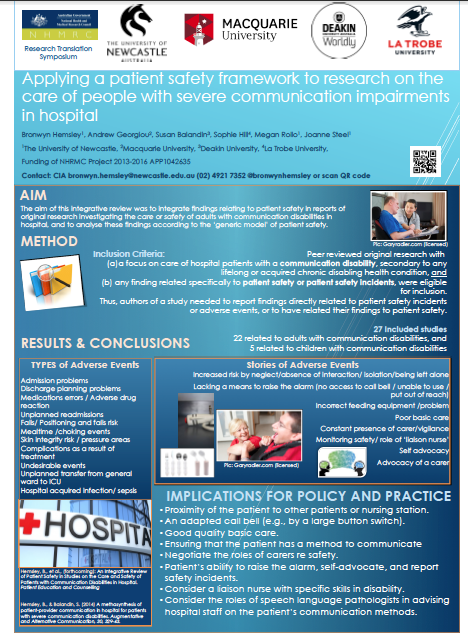 Applying a patient safety framework to research on the care of patients with severe communication impairments in hospital. Accepted to the NHMRC Research Translation Symposium, Sydney 27-28th October 2015. Hemsley, B., Georgiou, A., Hill, S., Steel, J., Rollo, M., & Balandin, S. (2015). 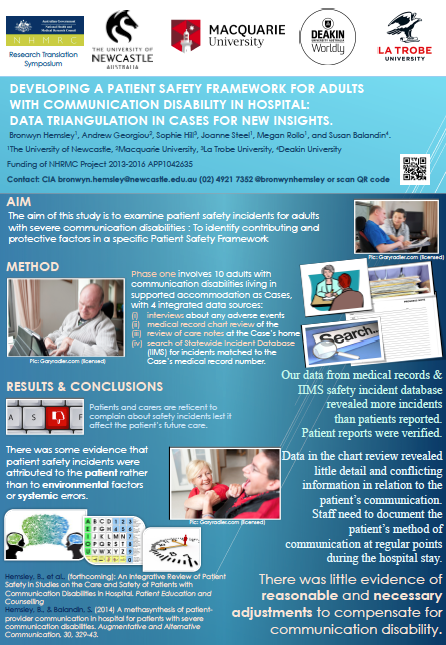 Developing a patient safety framework for adults with communication disability in hospital: data triangulation in cases for new insights. Submitted to the NHMRC Research Translation Symposium, Sydney 27-28th October 2015.